Markes Lambe (he signed his name like this and most references use this spelling but other references are found with various spellings such as Mark Lamb) was born in 1776 in Somerset, most likely in Bath. He was almost certainly the son of, grocer Mark Lamb and his wife Mary who had a shop in Stall Street, Bath. By 1791 Mark Lamb Snr had died and the business was being run by Mary Lamb & Son. An advertisement, shown below, from the 21 July 1791 edition of the Bath Chronicle announced that Mary Lambe had taken her son into partnership. From other advertisements of the time it is clear that, in addition to fresh teas, they also sold prime wax candles and spermaceti candles, as well as Wheble's Kensington Moulds (Wheble's being a famous London candle manufactory). In 1797 Mary Lambe took a lease of a property which comprised 35 Stall Street (referred to as the Nag's Head Inn, even though that hostelry had closed decades previously) and 36 Stall Street, which all formed one shop. 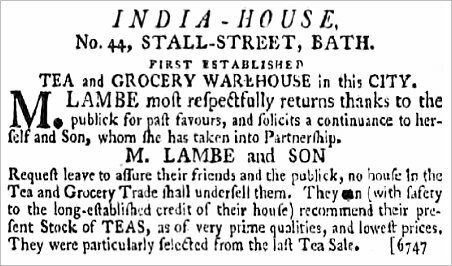 The business was still advertised as Lambe & Son in 1800. 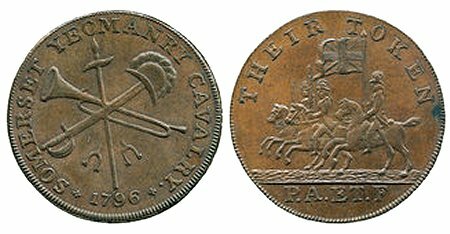 At left is a copper halfpenny issued by Markes Lambe at Bath in 1796. The obverse has a military trophy, the reverse shows three horsemen, on the edge is "I PROMISE TO PAY ON DEMAND ONE HALFPENNY". A penny coin is also known. Markes clearly left the business and was married, probably around 1802, settling in Beaminster, Dorset. His wife's name was Ann, and they had at least one child, Mary Ann, born an 13 January 1805 at Beaminster and baptised there on 19 October 1805. After leaving Bath, Markes trained and qualified as a surgeon and was listed in the 1811 edition of the London & Country Directory as a Surgeon of Beaminster, Dorset. He was listed as an owner of property in the 1813 Land Tax Returns of Beaminster, assessed at 7s 6d and indicating that he owned moderately substantial premises there. A lease dated 9 November 1815 in my collection indicates that Markes was living in Yeovil at this time since it notes he was renting a property in Hendford (today's 1 & 3 Princes Street) which he used as his home and medical practice for the next ten years. The property was owned by Thomas Bullock, Gentleman, James Glyde, Gentleman and Samuel Watts the Younger, Gentleman, (all of Yeovil). James Glyde and Samuel Watts were brothers-in-law (Glyde married Watts' sister Mary) and Thomas Bullock was likely the brother of Watts' mother, Mary née Bullock. In 1820 the lease Markes' mother had taken out for the premises in Bath, passed to Markes who was described in the lease as a Surgeon of Yeovil. Pigot's Directory of 1822 listed him as "Mark Lamb, Surgeon of Henford". Another indenture in my collection, dated 1825, shows that he paid the same Samuel Watts the Younger the sum of £1,850 (roughly £1.3 million at today's value) for a property in Yeovil (at an undisclosed location). During the 1830s Markes attended several meetings of the Yeovil Vestry. 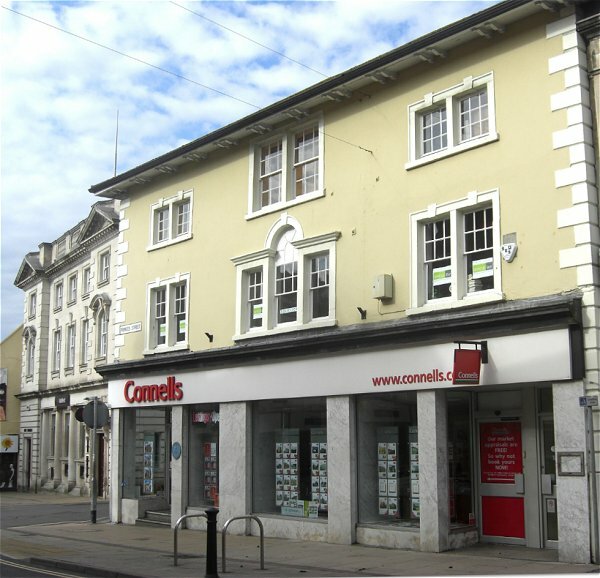 Ann Lambe died in Yeovil in the spring of 1839 and by the time of the 1841 census Markes, his daughter Mary Ann and a domestic servant were living in South Street. From the location in the census return it would appear that they were living somewhere between Wine Street and Addlewell Lane, although it isn't possible to determine which side of South Street. 65-year old Markes gave his profession as Surgeon. The 4 April 1846 edition of the Bristol Mercury announced Markes' death "March 22, at Yeovil, aged 70, Markes Lambe Esq. Surgeon". He was buried in Sherborne on 1 April 1846. After his death Mary Ann moved to Bath and in the 1871 census was listed as a lodger living at 5 Abbey Churchyard. 65-year old spinster Mary Ann gave her occupation as a Gentlewoman. An advertisement from the 21 July 1791 edition of the Bath Chronicle announcing that Mary Lambe had taken her son into partnership. The top section of the lease of 1815 in which Markes Lambe rented the building which is today's 1 & 3 Princes Street (but at the time was in Hendford). This photograph of Princes Street dates to around 1875 and is one half of a stereoscopic pair. It was taken at the time Henry Marsh Custard was running his bookshop / printer's / stationers which was situated in the three-storey building to the left of the cart in the photograph - today it is 1 & 3 Princes Street. This was the home and medical practice of Markes Lambe from 1815 to 1825. 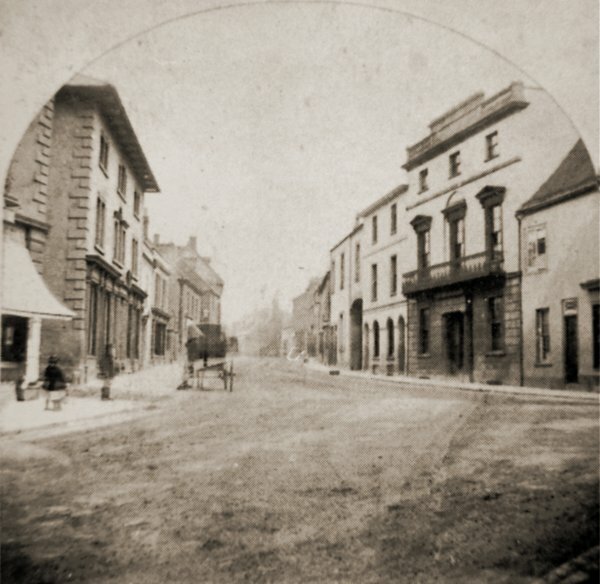 The narrow lane seen between the building and the building at extreme left was colloquially known as Porter's Lane, then Custard's Lane and later widened to become Westminster Street. The Princes Street elevation of this lovely building, the home and medical practice of Markes Lambe between 1815 and 1825, with the usual unsympathetic twentieth century ground floor shop fronts and the inappropriate removal of lower glazing bars to the first floor fenestration. Photographed in 2013. The signature of Markes Lambe on a property transaction of 1825. .... and the first sheet of the 1825 property transaction itself. .... and his signature in the Yeovil Vestry Minute Book, from the meeting of 26 March 1835.